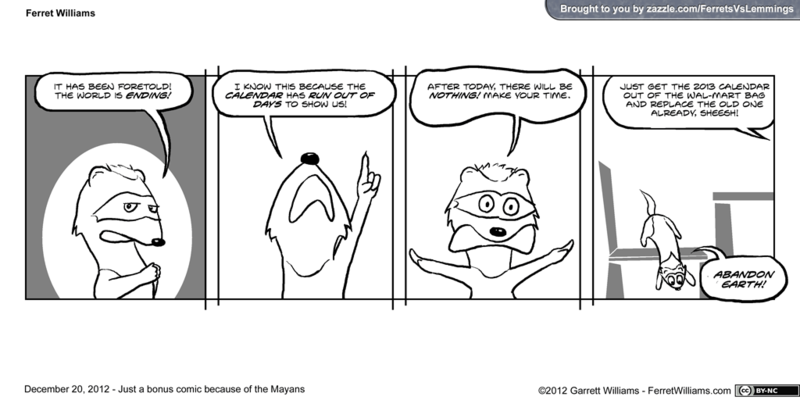 Tomorrow, the Mayan calendar will be cycling to a new b'ak'tun like our calendar cycles to a new century. This has a lot of people scared for some reason, even though the superstitious should be HAPPY that we're getting out of the THIRTEENTH b'ak'tun and moving on to the fourteenth. There are end-of-the-world parties going on all over, and sadly some are not jokes. The one advertised on our local radio is thankfully almost-certainly in a joking manner and everybody expects to still be around for their hangover. And yes, the comic is still on hiatus until New Year's Eve, but then it would be too late to do this comic. Also I'm experimenting with the template before the comic actually starts. The size must remain the same because Second Life is picky about image sizes(I post it there, too), so I'm trying to figure out if I really want all that white space. In black and white, the file size really isn't affected much anyway. I'm leaving that open white area for artist comments, like what people normally use alt text for(I don't like alt text notes on comics) or any sort of extra stuff. I should definitely move the copyright info closer to the comic, though, because this just screams "crop me out!". On the note about picky sizing, Inkbunny limits the width to 920px. If I want it to look right on both IB AND SL, the comic would have to be 512px wide, which wouldn't be quite as acceptable for me. I don't feel like exporting a version just for IB(or just for SL like I did for Kenny Chronicles), so I guess I'll just let Inkbunny do the resizing, even if it does cause blurring. That table and chair... I intended to just be a guide to trace for the final version, but it wound up looking just right. I was so tempted at first to get back into using a 3D model for that, just out of habit. I'm glad I forced myself to use simple shapes with the polygonal lasso tool. I'm trying to go for simplicity here, both in look and in production.